Electron applications even update themselves automatically. Updates are retrieved from known sources, such as a GitHub repository, via an update server. Electron began in 2013 as the framework for building GitHub's Atom text editor. GitHub open sourced Atom and Electron in 2014. Electron has an MIT license. Version 1.0.0 was released in 2016, and as of this year, it is available in Windows and OS X app stores as well as Linux repositories. Figure 1: The main process replaces the browser kernel as a freely programmable framework with a system connection. 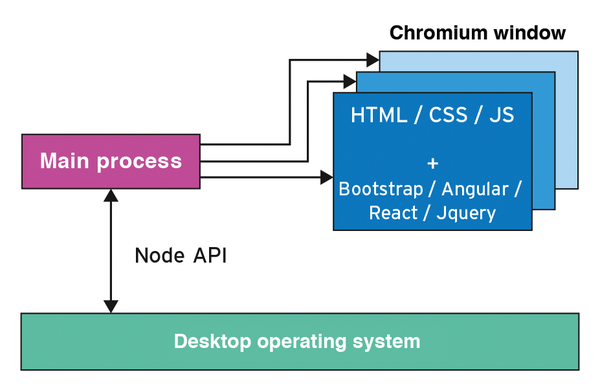 Because the code within the application always executes using the Chromium run time, Electron avoids the possibility of problems arising from dissimilar browsers or browser versions. 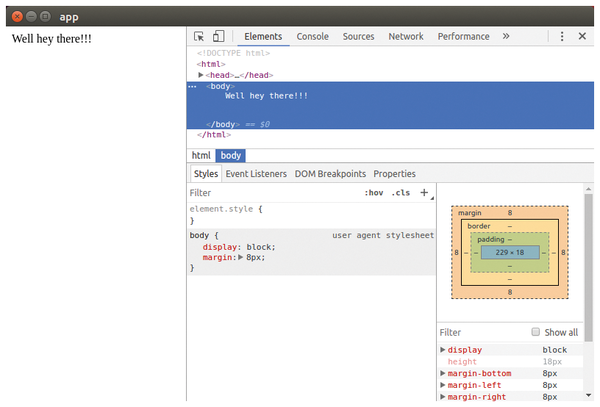 Developers also benefit from the debugging tools that come along with Chromium (Figure 2). Figure 2: Electron developers can call upon the help of Chromium debugging tools. The main process manages the browser window. The Node API facilitates the connection to the desktop operating system. The developer can extend the Node environment by adding additional node packages. Electron, the boilerplate project, and a set of tools used with Electron, including electron-packer, electron-builder, or electron-forge, all take the form of node packages. Listing 1 installs Electron and all the tools a developer needs to pack the Electron apps onto a Ubuntu 16.04 node. Line 1 installs git and curl via the package manager; line 3 installs the latest version of Node.js. The necessary package list is created by a Bash script, which curl retrieves in line 2, under /etc/apt/sources.list.d/nodesource.list, and then updates the list of available packages via apt-get. After nodejs in line 3, the script inserts the alternative node package manager, Yarn , one line later. With root privileges, Yarn then installs electron-forge  (line 6). Electron has a number of boilerplate projects  that accelerate the development process by providing an minimal executable app out of the box. These projects internally use electron-packer to create the Electron application and electron-builder to packetize platform-specific formats. electron-forge, which is installed in Listing 1, offers the best combination of both tools. It also comes from the workshop of the creators of electron-packer and electron-builder. The forge shell command makes use of electron-forge. The life cycle of an app starts when the developer taps the forge init app command into the keyboard. This command creates the app project directory from Listing 2 in the style of a boilerplate project. As with any node app, the node_modules directory stores all packages listed in the package.json configuration file – in the latest version. Finally, the src directory stores the minimal web app, which the developer then converts step-by-step into the desired application. Initially, the directory contains the index.html HTML document and thus the entire web app, as well as the index.js file. The programmer checks the development progress by switching to the app project directory and entering the forge init start command. Since a watch process like Angular is missing, a location.reload() reloads the app via the debugging console. Figure 2 shows the started app at run time. The debugging tool appears in the Chromium window on the right side of the screen by default. In the final version, the developer has to remember to disable the debugging tools in the main process code. The yarn.lock file from line 5 in Listing 2 remembers the currently stored packets under node_modules. This mechanism makes it possible to reproduce node projects on other machines on a scale of 1 to 1. Does the private photo archive on your computer just keep on growing without ever seeing any attention? Mike Schilli whips up a home-grown solution to get rid of bad photos with the Electron framework. A simple design, efficient performance, and a built-in ad blocker are reasons for a closer look at the Min web browser. Stacer is a handy graphical tool for cleaning up your Linux system.